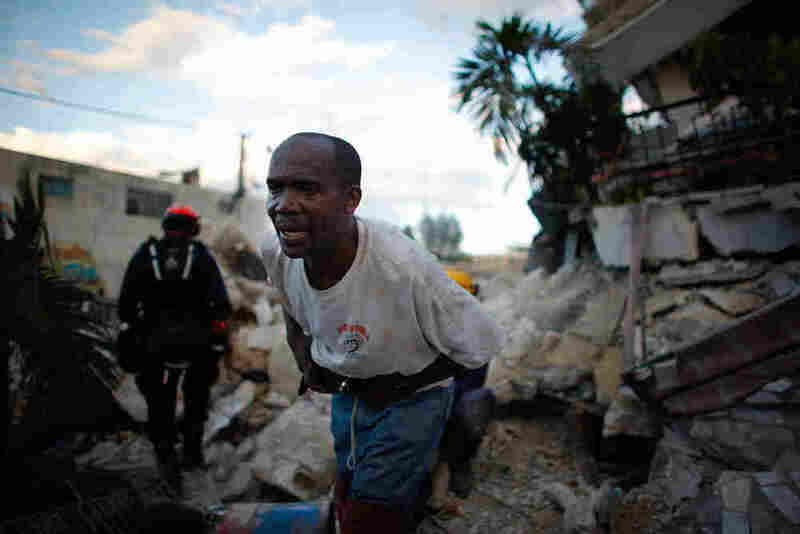 Search And Rescue Teams In Haiti Race Against Time The teams are moving through Haiti's capital city, trying to locate people who might still be stranded beneath collapsed buildings. One convoy of three dozen search and rescue workers from Spain and Iceland, who are running out of time, face the challenges of searching too many buildings — and chasing false rumors of survivors. As part of the international response in Haiti, search and rescue teams are moving through the capital city, Port-au-Prince, trying to locate people who might still be stranded beneath collapsed buildings. Even before the sun is over the horizon, search and rescue teams based at the main airport in Port-au-Prince are preparing for a long day. One particular convoy is made up of three dozen search and rescue workers from Spain and Iceland. They climb into the back of two large dump trucks loaded with gear and search dogs. The Spanish squad works the dogs. Icelandic squad members say they're more at home searching for avalanche survivors, but for the moment, they and other rescue workers are driving through the wreckage of Haiti's capital city. Despite the early hour, the streets are choked with people. The first stop for the search and rescue team is a flattened hotel in what could be charitably described as a dicey neighborhood. The rescue workers put on their hard hats as they pass through one particularly unruly stretch. Looters cart off bags of rice and anything they can lay their hands on. 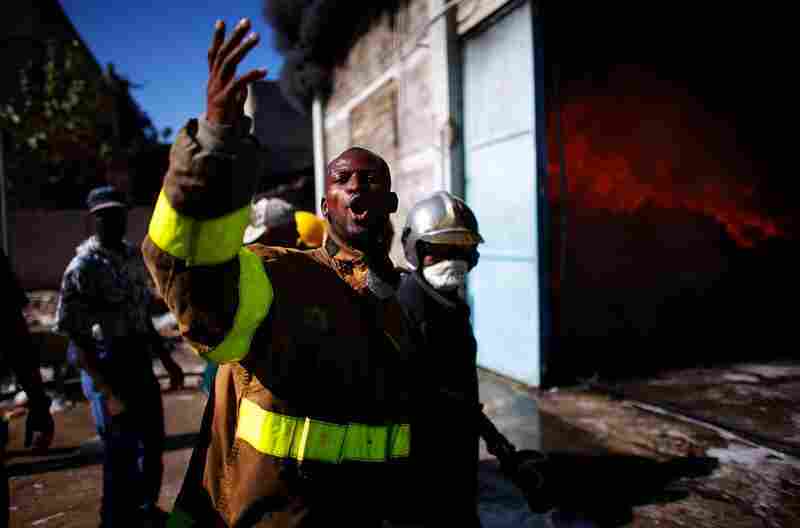 Firefighters yell for help as they try to put out a fire at the Pasta Mamma noodle factory in Port-au-Prince on Monday. People scramble to pick up spilled spaghetti at the burning restaurant. 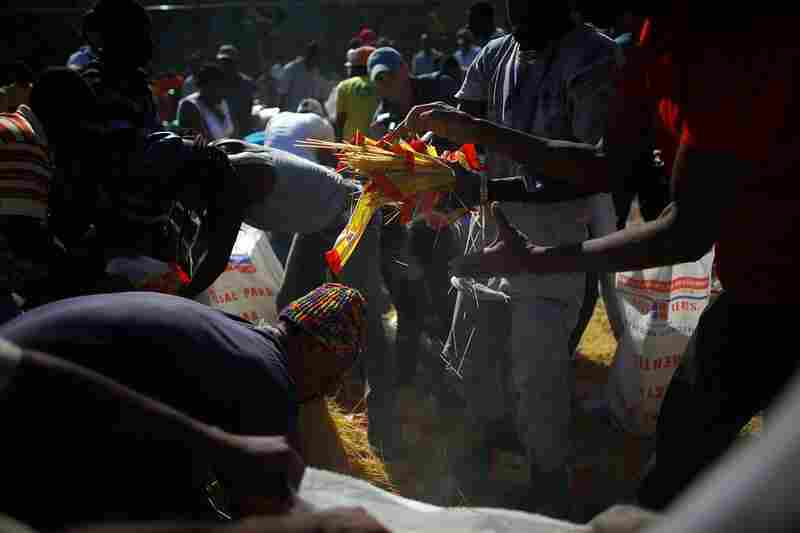 With food supplies already low, the fire is yet another blow to a desperate capital. 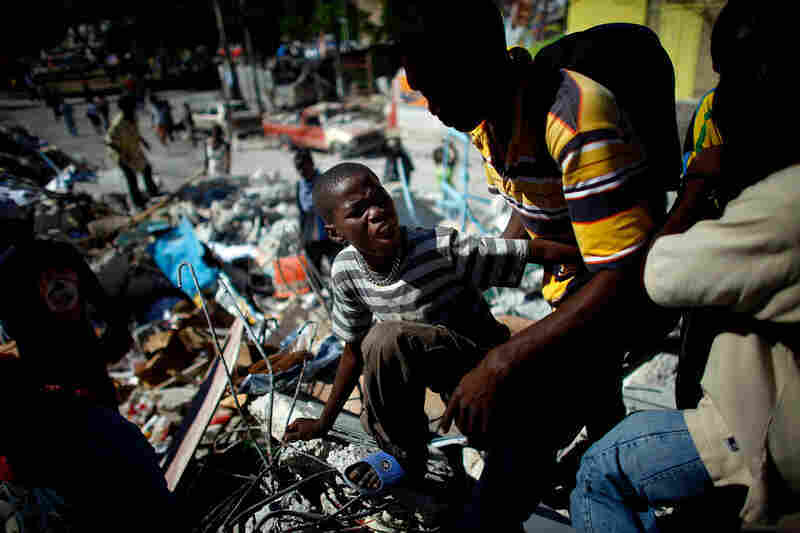 A man grips a knife as he looks for other looters to come out of a shop near downtown Port-au-Prince on Sunday. 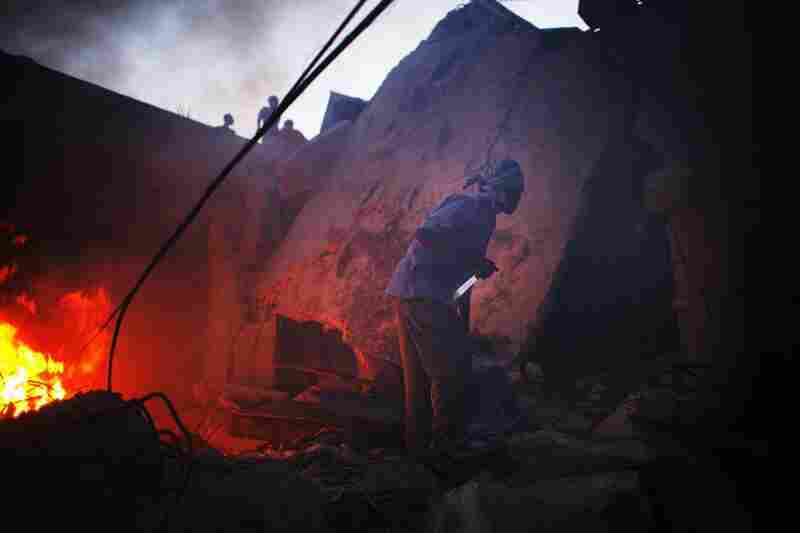 A man carries a shotgun as he walks through a collapsed burning building while trying to keep looters at bay on the streets outside in the commercial district of downtown Port-au-Prince. 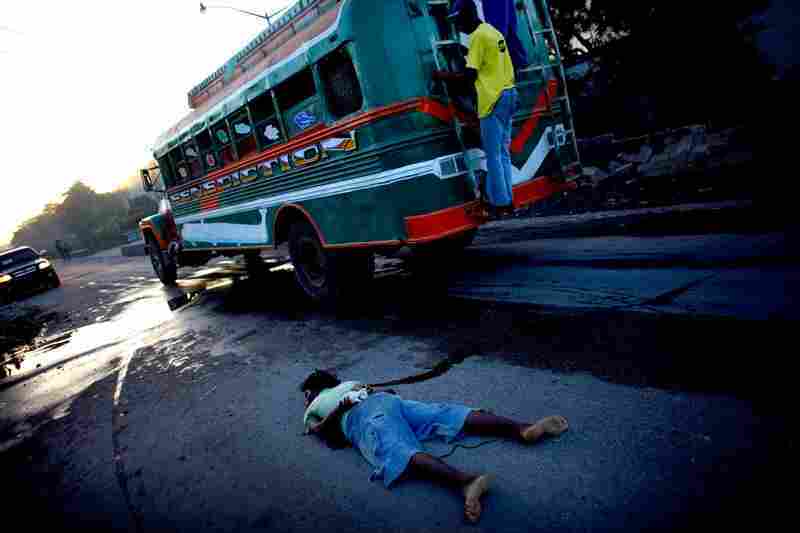 A body, with tied limbs and apparent gunshot wounds to the head, lies in the street Monday. 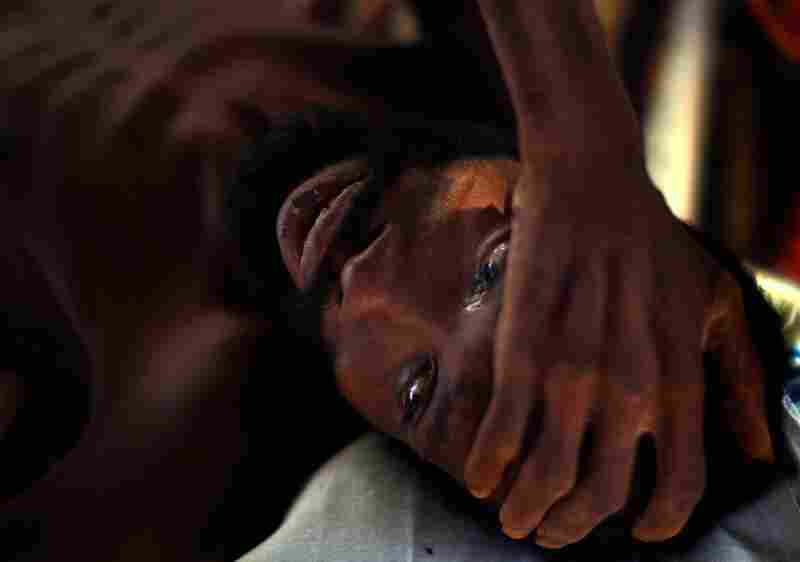 Robenson Bernard cries at a hospital in downtown Port-au-Prince on Monday. Bedridden since November, none of the family members who used to take care of him have come since the quake. 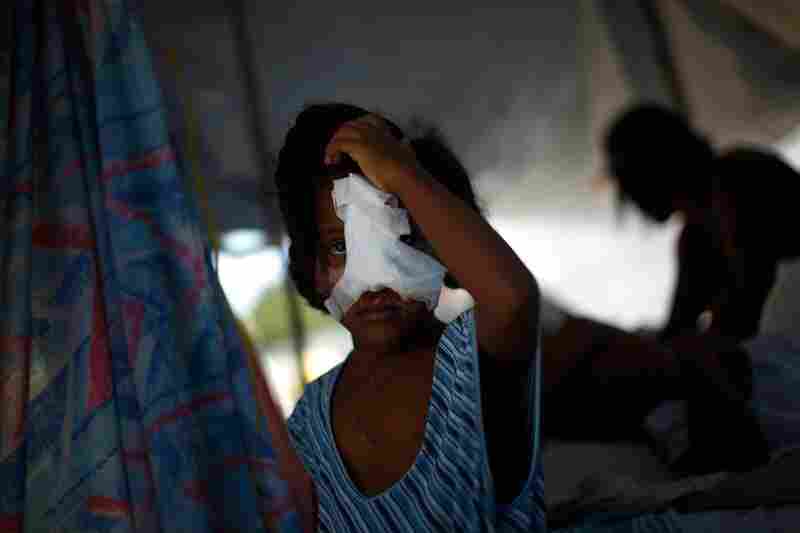 A Haitian girl, whose nose and cheek were shattered in the quake, holds her head at the main hospital in downtown in Port-au-Prince. A U.S. Navy helicopter flies over Port-au-Prince on Monday. 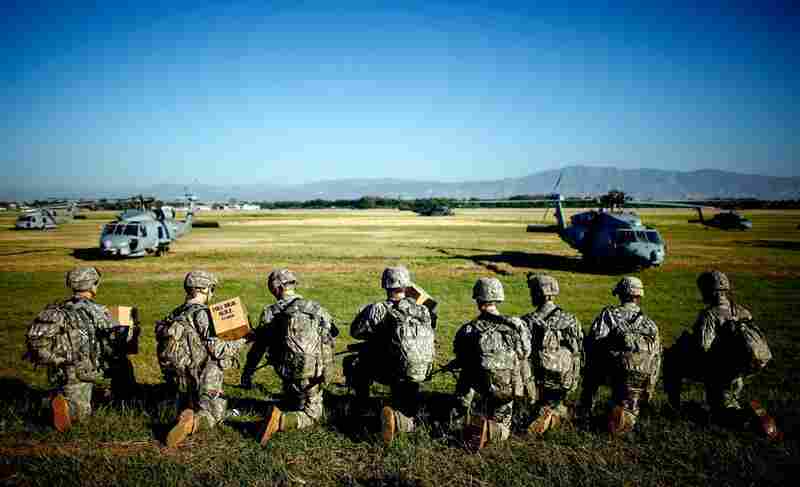 Soldiers with the U.S. Army's 82nd Airborne Division prepare to board helicopters to create operating bases across Port-au-Prince on Monday. 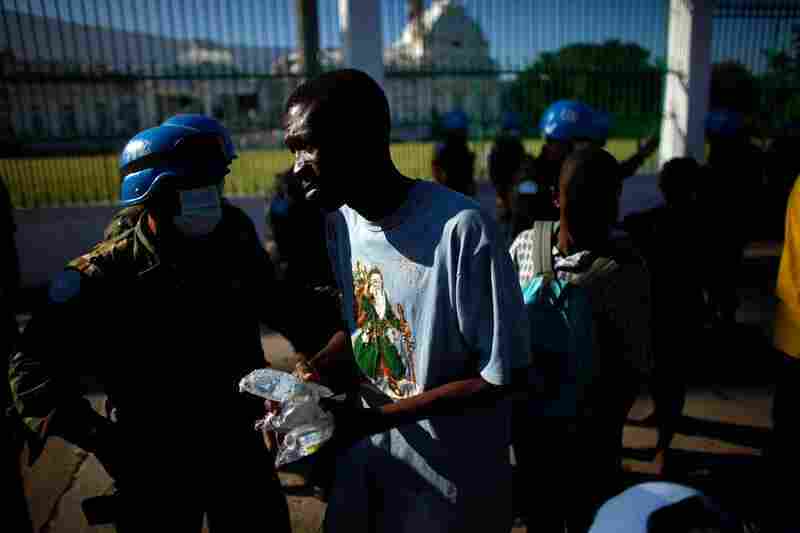 United Nations soldiers hand out water in front of the National Palace on Sunday. 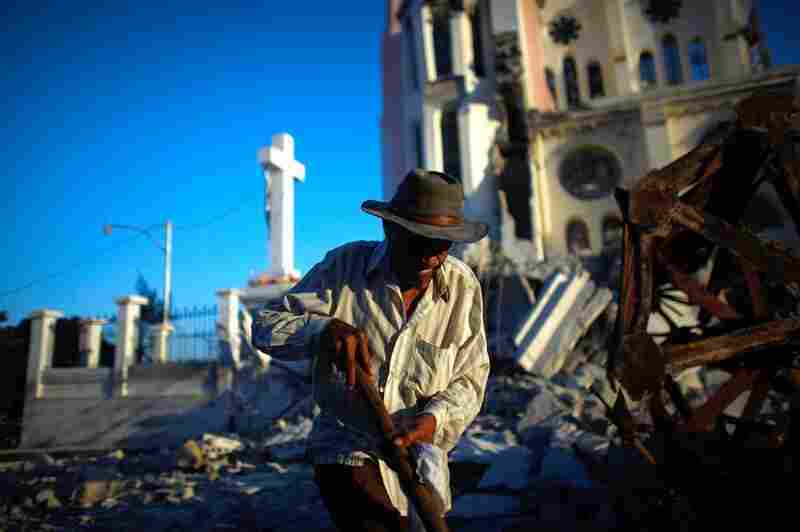 Across Port-au-Prince, people attend Sunday services in the rubble of churches. 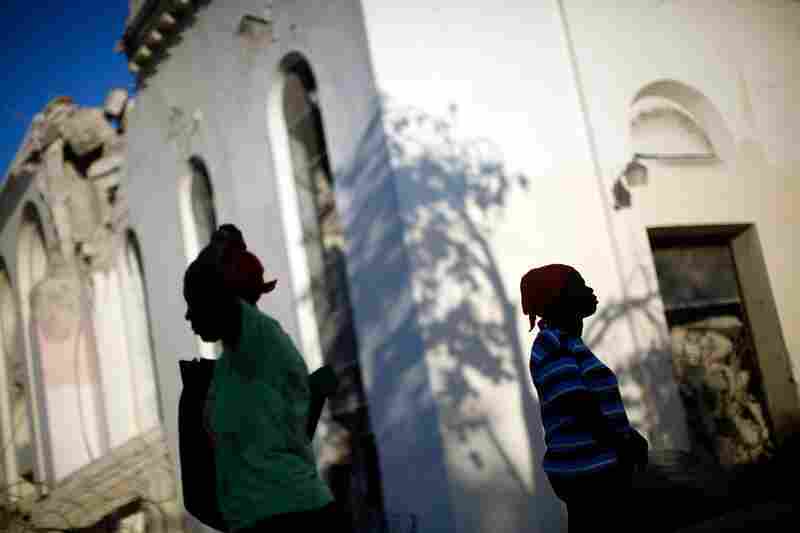 A man walks past Our Lady of Assumption Catholic Church in downtown Port-au-Prince. 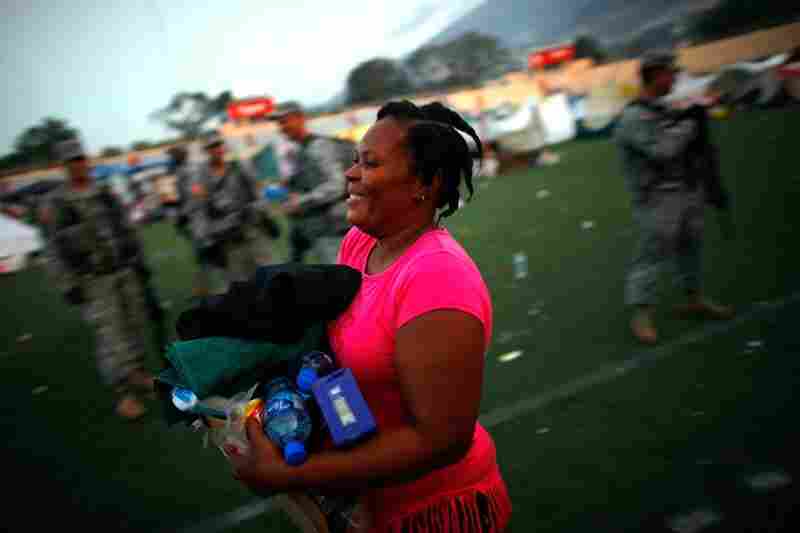 A Haitian woman receives her first ration of foreign aid in a soccer stadium in Port-au-Prince on Saturday. 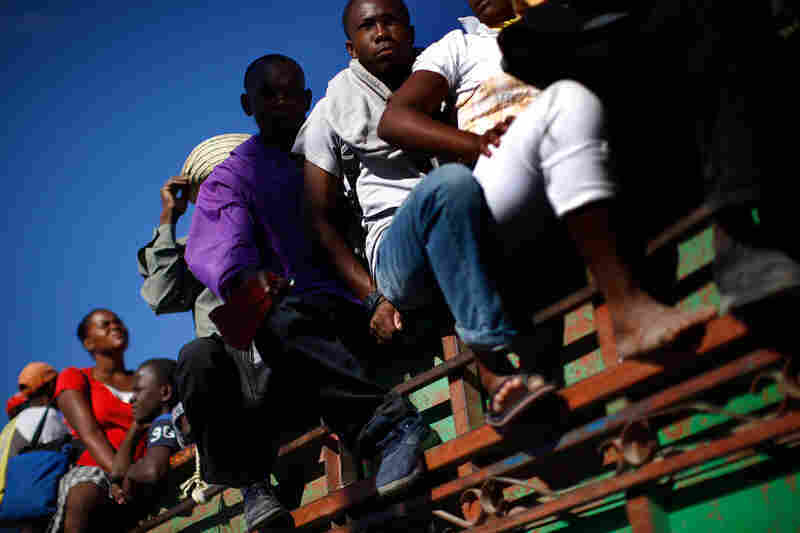 Haitians line up for U.N. food rations. Desperately needed aid is finally arriving in Port-au-Prince, but congestion at the airport is hampering efforts to get supplies to survivors. Women stand in line for food rations being handed out by the United Nations Friday in Port-au-Prince. 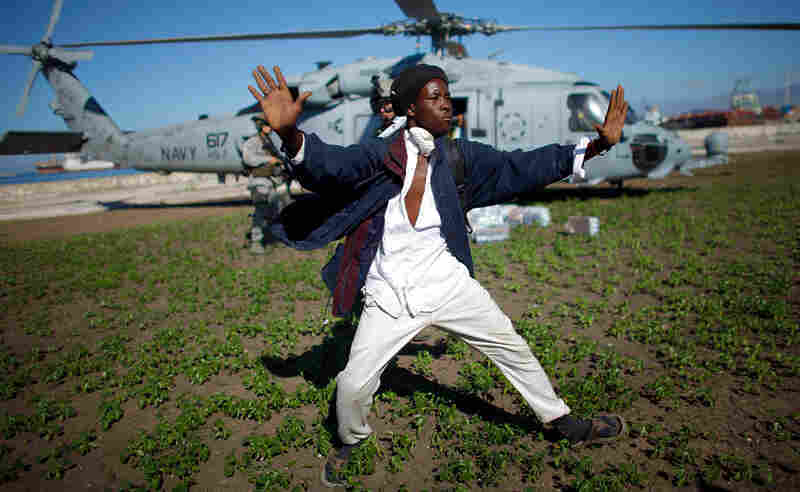 A Haitian man tries to keep a crowd from rushing a U.S. Navy helicopter as it unloads water in a Port-au-Prince park. As survivors await international aid Sunday, Haitian men pass out water and soda taken from a collapsed store near Port-au-Prince. A boy uses a jug of water to wash off in a city park near the national palace. 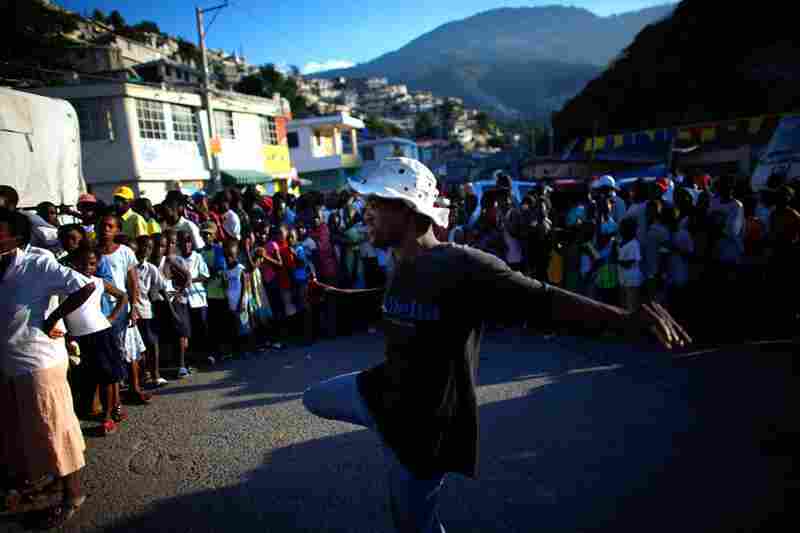 Across Port-au-Prince Haitians are scrambling to salvage what they can. A woman carries a bag of clothing recovered from her apartment. 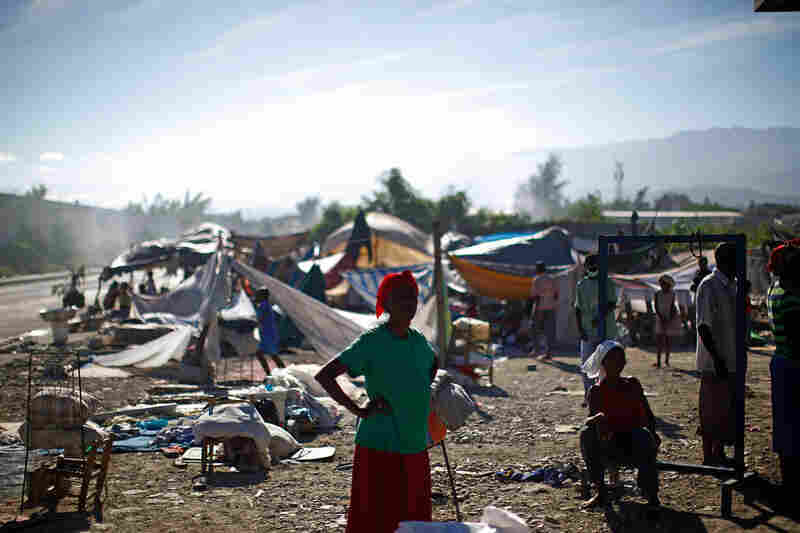 Refugees wait in a makeshift camp Saturday near downtown Port-au-Prince. 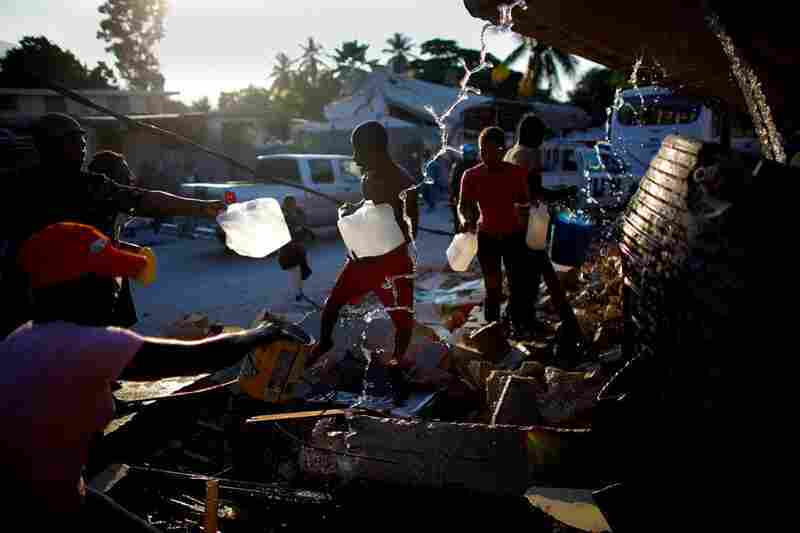 People gather around broken water pipes to collect fresh drinking water Friday in Port-au-Prince. The streets are filled with people carrying their few remaining belongings. 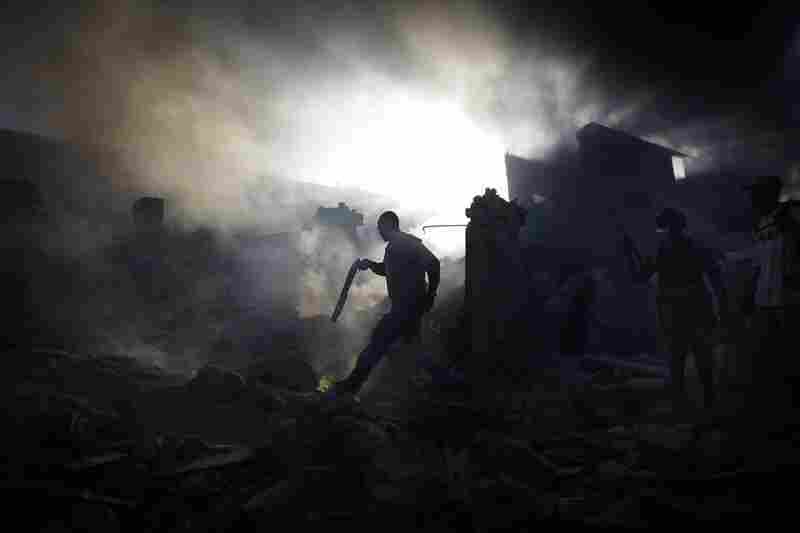 The search for people in the rubble continues. A Haitian rescue worker helps the L.A. County Search and Rescue team in in downtown Port-au-Prince. 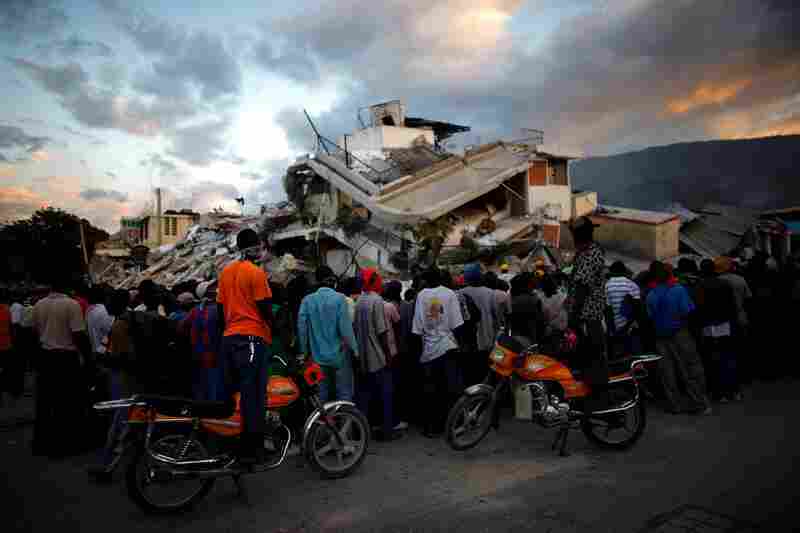 Haitians watch the L.A. rescue team's efforts at a collapsed building. Officials estimate at least 50,000 people were killed by the quake. 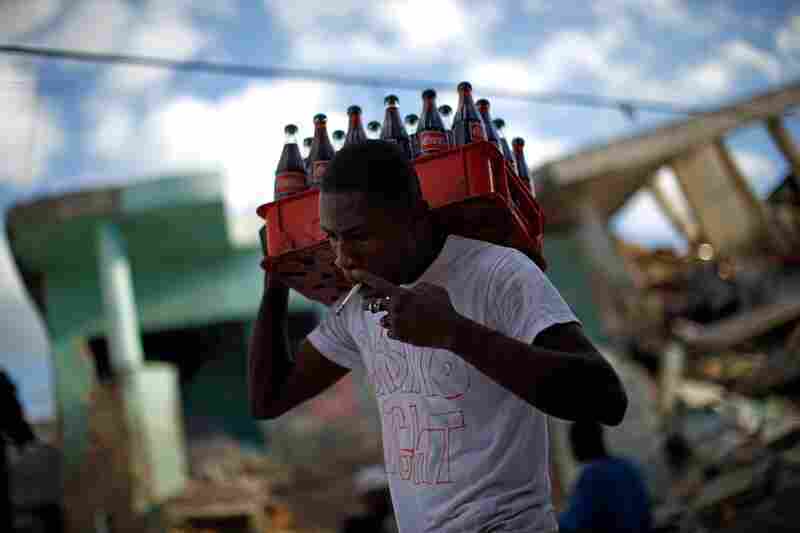 A boy tries to get a drink as looters scavenge the rubble of a supermarket Saturday in Port-au-Prince. 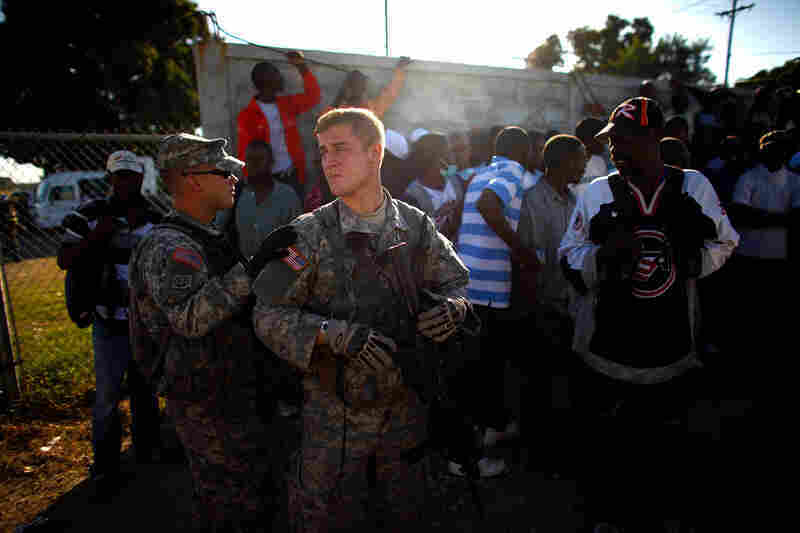 First Lt. Greg Bitner watches over Haitian men who have gathered at the airport in hopes of getting work. 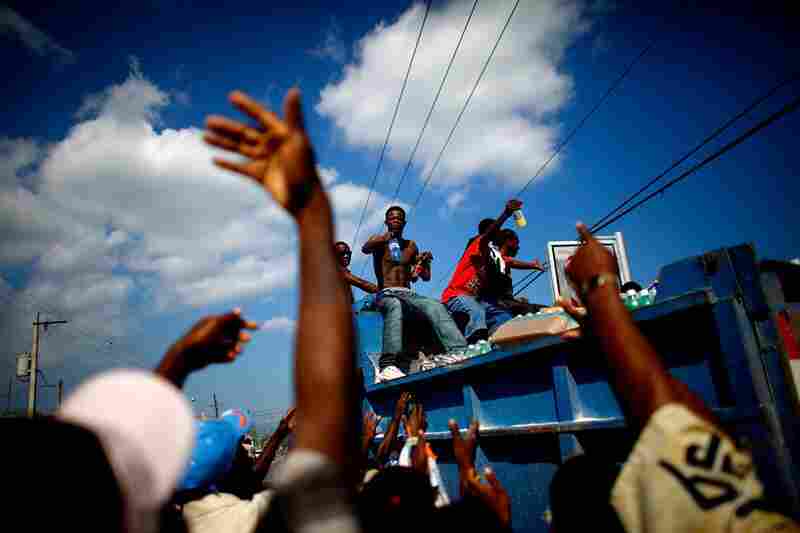 Haitians leave Port-au-Prince on a flatbed truck. 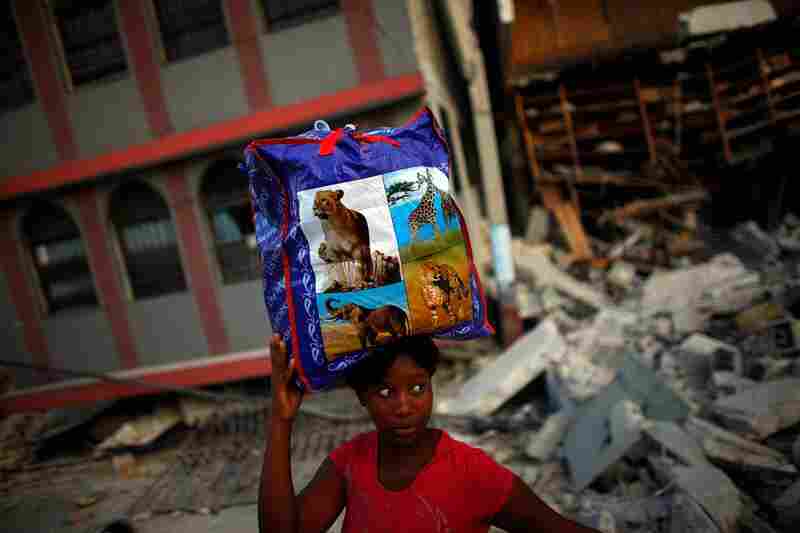 Other towns in Haiti were also hit hard, but not much aid has made it beyond the devastated capital. 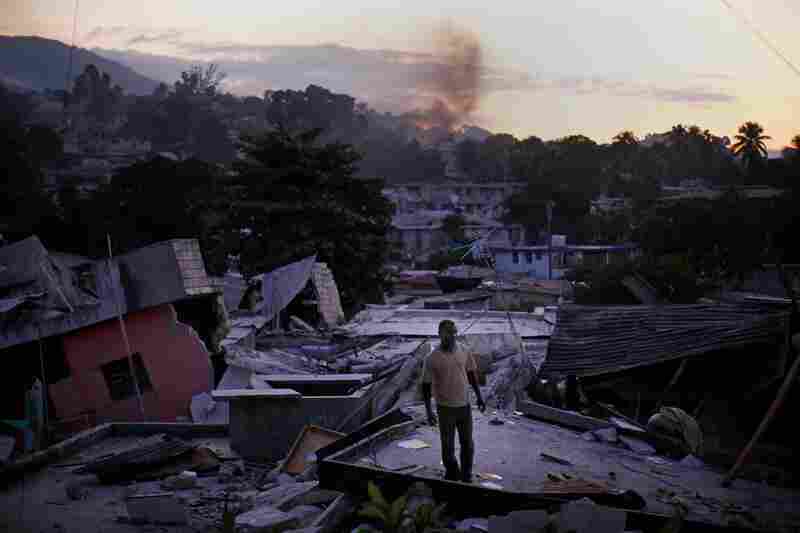 A man stands on a rooftop yelling out for any sign of his missing relatives Friday in a devastated hillside neighborhood near downtown Port-au-Prince. Michael Olafsson, the safety officer with the Icelandic team, says the area is considered a red zone. "You notice on the way there were local militias guarding," he says. "You could see how they were taking toll of people going past." The convoy passes block after block of flattened buildings before finally stopping in front of the hotel. Local rescue organizations said they had received reports that people could be trapped under the building. Olafsson says that often, the reports are nothing more than rumors, but they have to be checked out. While the rescue workers unload the trucks, squad leader Magnus Hakonarson talks to locals watching the operation. With the aid of a translator, Hakonarson starts to get information. He draws a rough sketch of the hotel. The search team sends dogs into the destroyed hotel. A dog will mark his spot if he detects anything, says Petur Goodmundsson, a paramedic and technology specialist. "They bark or turn their head in a special way. And the dog handler knows his dog. So the dogs mark in a different way," he says. We are listening for noises and people moving or people knocking. Like once we found yesterday the person was knocking, so we told them, 'Knock three times,' and they knocked three times. Then we know it's not the water dripping or animals, rats, something like that. If two dogs indicate there may be a person still alive, a listening device is installed. Rescue workers will knock on the concrete. Goodmundsson says they're not expecting to hear the word "help." "We are listening for noises and people moving or people knocking," he says. "Like once we found yesterday the person was knocking, so we told them, 'Knock three times,' and they knocked three times. Then we know it's not the water dripping or animals, rats, something like that," he says. If they can talk to the survivor, rescue workers try to determine if anyone else is trapped. Despite all the efforts to find someone at the hotel, it's determined there are no survivors, and the teams start packing up. Next stop is the University of Haiti. As the trucks head off, squad leader Hakonarson says it's tough leaving the various locations. "Searching is easy. Leaving an area with relatives, that's a difficult thing," he says. By the time they reach the university, a search and rescue group from the U.S. is already working the area. But local people start approaching the group, saying they are sure people are alive in a number of other buildings. The rescue crews question each person. It is a long process and requires looking around damaged buildings, says Erlander Birgisson, a structural engineer on the Icelandic squad. "I can see from the pictures they took, it's very unstable," he says, studying a structure. "If we have an aftershock, this will go down. A small tremor, yes, will bring this down." Birgisson says it's incredibly difficult to try to rescue people in the ruins of a city this size, with so many houses -- and with so little time remaining.